Stitchboard Community - Hello, I&#039;m new and need some advise. community home > Crochet > Welcome: Introduce Yourself > Hello, I'm new and need some advise. Hello, I'm new and need some advise. Hi, I'm new and am attempting to do my first portrait in crochet. I've only seen a couple of them finished but both of them were done in vertical rows. If I work my pattern in a horizontal pattern will it be out of porportion? I'd really hate to do all of that work to find it's messed up. Please advise! Re: Hello, I'm new and need some advise. As long as you send the pattern through correctly, it shouldn't be out of proportion. In other words, if you send the pattern in vertically and then work it horizontally, it will be out of proportion because crochet stitches (e.g., single crochet stitches) are wide, not high. If you send it through horizontally, then your stitches will be wide and can be worked horizontally. The program isn't really concerned with how you send your image through, because it doesn't understand the difference between working your piece in "portrait" or "landscape" mode; it's up to you to be sure you send it in a way that will give it the proper aspect ratio so your stitches aren't skewed. I'm not sure I understand what you're saying about the way I send the picture. I added it in the upright manner in which we'd be looking at it and thought I could work it from the bottom to the top using the graph. What is the difference in landscape and portrait mode? Hi! Portrait mode is to work a vertical rectangular piece (as in a portrait), landscape is to work it as a horizontal rectangular piece (a la a landscape). I'm not sure what you're asking, so my apologies. Please clarify. Are you talking about working your piece side to side, your rows going from bottom to top as a vertical rectangle, or are you planning on working it bottom to top, so to speak, with your rows going side to side, as a horizontal rectangular piece? Either way it doesn't matter, as long as you send it through the way you'll be working it. You just need to be sure your stitches are keyed for short, wide crochet stitches if you're using standard single crochet. You definitely can work it from the bottom up, as long as you didn't rotate it. I've never actually seen anyone work them side to side, but many people don't realie that crochet stitches are not square, so they'll use any old cross stitch graph and think it doesn't matter. So maybe the ones you've seen that are worked side to side are people who think it doesn't matter, and don't even realize the image is a bit skewed. Or maybe they are doing c2c? I'm planning on working from side to side horizontally and from bottom to top. That's the way I scanned in the picture so I'm in hopes that'll work. I asked for a graph for standard crochet and I'm doing a single crochet. So is that as it should be? Thanks Sherry. The only ones I've seen worked of a portrait and done in embroidery floss were done vertically from side to side and I had planned on going horzontal from bottom to top. This piece is coming out 150 stitches wide and 295 tall with 60 (yikes) colors used! Does this sound right? I scanned the pic in upright and planned or working it just like we'd do a regular afghan. Bottom to top, horizontal rows. Okay, I think we're using terms interchangeably that aren't interchangeable. 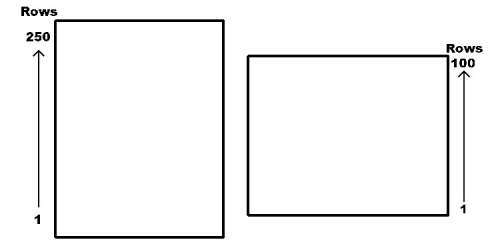 So here's an example; please specify which one you're doing in the drawing below, the left or the right. In this example, your afghan is either 100 stitches x 250 rows (left) or 250 stitches x 100 rows (right). Which one will you be doing? Will you be working from row 1 to 250, or will you be working from row 1 to 100? If you're working as the example on the left, where row 1 starts at the bottom and goes to the top, that's called working vertically. If you're working as the example on the right, where row 1 starts at the bottom and goes to the top, that's called working horizontally. This is the cause of my confusion. If you say you're working horizontally, the example on the right is what I'm seeing. So if you're actually doing the left example, you're working vertically, and that's what we call portrait mode. If you're doing the right example, you're working horizontally, in landscape mode. Think about it as a picture on the wall. In most cases, the left would more likely be a portrait of a person, the right would more likely be a landscape, such as a sunset or a forest scene, where you want to see a wider view. So, as long as you send the image in either like the example on the left, if you'll be working the rows that way, or if you send the image in like the example on the right, if you'll be working the rows that way, you'll be working the stitches correctly. My guess is you're really doing what's on the left, but you're calling it horizontal, which is incorrect, as it's vertical. And if that's the case, as long as you sent your image in as a vertical image, then it's fine. I am doing a portrait as the drawing on the left side. But I'm working from the bottom to the top, back and forth exactly as the picture goes from bottom to top. But.... I've seen other portraits worked from side to side. For example. My subjects chin will show up before the mouth, which will show up before the nose, etc. But in other's who have crocheted a portrait they worked side to side so the ear would show up before the face. Does that make sense? This is why I'm concerned about mine looking right when it's done. Thanks...knowing you're working portrait clarifies things a lot! The main thing to be concerned about is sending your image through the correct way. With single crochet, as long as you've sent your image through portrait-wise, not landscape-wise, you'r stitches won't be skewed (remember, single crochet stitches are wide and short). It really depends on how other people want to work their patterns. Usually, an afghan is worked bottom to top (e.g., portrait) because when you see it on a bed it's usually looked at from the foot of the bed, not the side. I'm not sure what else you'd want to do besides what you're already doing. Sorry if I'm not understanding! Thank you that clarify's thing a lot for me.